A local bee-keeper is trying to create a state law that would prevent honey mixed with additives from being labeled as honey. Thurmont’s Byron Rice is the owner of “Lord Byron’s Apiary” and cares for 80 live colonies of bees in the summer months. 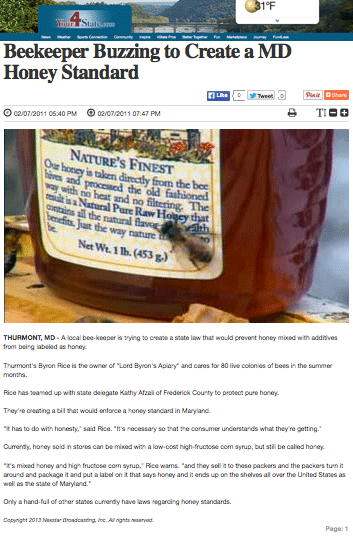 Rice has teamed up with state delegate Kathy Afzali of Frederick County to protect pure honey. They’re creating a bill that would enforce a honey standard in Maryland. Currently, honey sold in stores can be mixed with a low-cost high-fructose corn syrup, but still be called honey. Only a hand-full of other states currently have laws regarding honey standards.